OK... you talked me into it... now I need to decide if I forgive you! A small college town is gripped in terror as coeds are being found burned alive. Carved into their charred remainsare the words "Join or die". The police has no leads, but when a student discovers that the hottest sorority on campus is actually a coven of devil worshipers, she's brutally murdered by the Satanic witches. At the student's graveside her sister vows revenge and sets out to make things right. Hunter becomes the hunted as she fights her way through a maze of Satanic rituals, murder, beheadings, lesbianism and black magic in her quest for vengeance, as all hell breaks loose in the final showdown between good and evil. OMG... what a total and utter waste of time! Naturally after seeing the trailer to this movie the other day online I was not expecting much of anything at all. But in this case I was not expecting anything and still got disappointed! The acting is atrocious... the quality of the effects is laughable... and the DVD itself is pitiful! I got this DVD for free.... And I Feel Cheated!!! I was never so thrilled to see a set of credits roll! Eric can we have it as a feature review ? So if I understand you well this movie is better to go where Mr. Smiley goes ? and there has been movies I didn't like before... but not to this extent. I got this DVD for free.... And I Feel Cheated!!! As I always say, though, you gotta see the bad ones to appreciate the good ones. Or a friend of mine usually point out, that if you eat steak everyday, it's not special anymore. I don't know what I will do with this one. I usually give unwanted to family and friends. I keep them if they have anything about them that I like... but with this one this is not the case. Only problem... I don't want to torture my friends and family with it... and if I sold it I would feel like I am cheating someone. So I think the first step will be..
Slide into an out-of-this-world adventure as all 22 thrilling Season 4 episodes of 'Sliders' land on DVD for the first time ever! 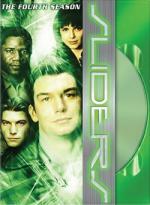 Reunite with genius Quinn Mallory (Jerry O'Connell) and his fellow Sliders – Rembrandt (Cleavant Derricks), Captain Maggie Beckett (Kari Wuhrer), and Quinn's brother Colin (Charlie O'Connell) – as they jump in and out of alternate Earthly realms, battle the ruthless Kromaggs, deal with their tricky doubles, search for their mysterious birth parents, and try to land on the elusive Earth Prime. Accompanying them on various leaps through time and space are spectacular guest stars including Adrienne Barbeau ('Escape from New York'), Shane Westz ('ER') and Malcolm Jamal-Warner ('Jeremiah'). It's an absolute must-have for every sci-fi fan! This season is still not as good as the first 3 seasons... but it is still enjoyable. There has been some pretty good episodes in this set. I haven't seen much of anything for special features on this set so far. Not sure if there is any or not. But all I have seen so far is a few trailers for other titles they want you to buy on Disc 1. Oh well... at least I have the episodes. Get ready to match the stars...as we play everyone's favorite big money match game! On DVD for the first time ever, this is your chance to experience 30 of the greatest episodes of this iconic game show, uncut and beautifully transferred from their original masters. As one of the most popular television shows in the '70s and early '80s watch a nostalgia masterpiece with a sharp fashion sense and a disco diva style. 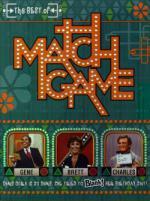 Match Game is a classic with a rich TV history watched by million over its broadcast lifetime and now fondly remembered as part of growing up around the TV set. From your favorite stars, including Match Game perennials Brett Somers, Charles Nelson Reilly, Betty White and Richard Dawson to Gene Rayburn's custom microphone and crazy antics - this collection has it all! Enjoy hours of rare bonus material including the pilot episode of 1962's The Match Game, a special tribute to Gene Rayburn, an exclusive interview with Brett Somers and much more! There was always something extremely fun for me with this show. This is one of my all-time favorite of the classic game shows. As I said about the Family Feud DVDs I been watching... when a celebrity is on a game show it makes it twice the fun for me to watch. The 4th episode on the first disc has Loretta Switt and McLean Stevenson... both from the hit classic sitcom M*A*S*H. I am looking forward to watching the rest of this set. Not directly related to your review, but you are the tv guy. So I've to ask you my question : Do you know if the same kind of compilation exist for The Gong Show? I've the movie and it's one of the few film that make me laugh from the beginning trough the end and I'm sure that the show is funnier (never watch it). I haven't even thought of The Gong Show in years! I checked TVShowsonDVD.com and a few online places. But I don't see any signs of any episodes being on DVD. In sixteen chilling tales of the supernatural, on 3 DVDs, New Dominion Picture's 'A Haunting,' takes you inside real-life horror stories. The series originally aired on the Discovery Channel, and each eerie one-hour episode features eyewitness accounts and cinematic re-enactments of some of most spine-tingling, ghostly hauntings ever recorded, filmed in actual locations where these apparitions took place. They are all but guaranteed to spook even the most skeptical observer, but you can judge for yourself: are they imagined, or are they real? Episode by episode, you'll be shocked and surprised by the spell-binding tales. Take the case of the dance club haunted by ghosts from a by-gone era, the child inhabited by evil that only an exorcism will cure, or house-haunting specters, scaring the wits out of their unsuspecting victims. 'A Haunting' explores these and many other unexplainable, eerie, and macabre tales of the paranormal. By the end of each amazing story, you will experience a lingering sense that life and death are much stranger than you could have possibly imagined! My daughter and I just watched the first 2 episodes of this series... And I just had to comment on this series right away. I have to say... going by these two episodes at least... this must best "true Hauntings" series I have ever seen! The first episode is The Lake Club Horror it is about a haunted night club (obviously called The Lake Club). This one is a good first effort. But a little more on the average side. But the second episode in this set. The Haunting of Summerwind... now this episode was excellent! I was glued to the set while watching this episode. It is about a woman that finds an old rundown mansion that she is instantly attached to and must buy, move her family in... and fix up the place. when everything goes haywire from haunting mischief to her husband being possessed. I know next to nothing about this series. I do know it is a Discovery Channel series. And know that season 3 is also out... and season 4 is scheduled to come out soon. I do not know if this is a current series... or if it is a series that has ended and is just showing reruns. I do know... going by these 2 episodes anyway... I will collect all that they decide to release! 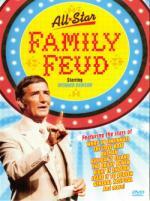 Richard Dawson is the original and best host of Family Feud during it's almost thirty year run. This DVD collection includes some of the best episodes featuring movie and television stars. ABC created a number of prime time one hour specials, where celebrity players competed for charity. Relive hours of fun and so many laughs, and become part of the family again and again! And this completes the set. It is of course more of the same... but for some reason this disc didn't strike me as quite as good as the previous 3. For one thing it seems people got a little confused when picking the shows for this disc... they showed the first round of one of the games... then just dropped it and moved on to the next set of games. Leaving us wondering who became the champs. They only showed the first of the 3 rounds for it. Struck me as a little weird. There was some good teams on the first half of this disc... but on the second half of the disc I didn't recognize many people at all... so I guess it was less interesting for me. Over-all I would say this is a good set and glad I have it in my collection... and I would like to see another set of All-Star episodes released!